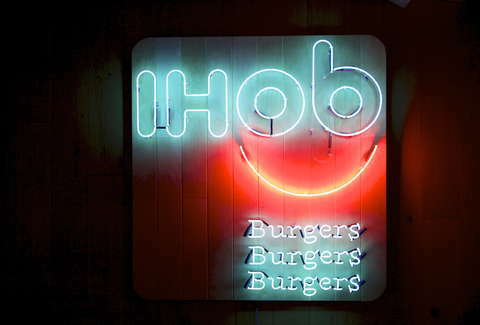 IHOb Is Dead. Long Live IHOP. We are pleased to report that everything's going back to the way it was. No, flip-phones aren't coming back, and no, cargo shorts aren't acceptable again -- something even better has happened. IHOb has gone the way of the Wicked Witch of the West. It is dead. Ding-Dong. Let us eat pancakes and guzzle syrup in celebration. You may recall the halcyon days when IHOP was building anticipation around what the dreaded new acronym would stand for. The internet had a good time guessing/being grossed out by the sound of the word. Finally, it was announced that IHOb stood for International House of Burgers, everyone let out a collective, "k," and Wendy's roasted the chain, as it is wont to do. And then we lived under the tyranny of IHOb. Until Monday. The news was announced via the IHOb Twitter, and IHOP seamlessly made its return, like we'd all clicked our heels and found ourselves back on Dorthy's farm. If you find yourself thinking, well that whole episode was strange and short-lived, maybe this bizarre Twitter exchange will clarify things for you. You see, the Ps are Bs. Like in the name. To be fair, the now-defunct IHOb social media account is right: We did talk about it. In fact, we're talking about it right now. For the last time. Long live IHOP.